Welcome to our wonderful Becoming Your Best podcast listeners wherever you may be in the world today. At this special time of year, we would love to express our gratitude and thanksgiving for you. This has never been truer today, than in any time in the world’s history. This change in the world can be quiet, small and subtle good and worthy acts and the world is never the same again. Those small, quiet, and subtle good acts can grow to have an impact far beyond what one could have ever imagined. An example of that are the simple, quiet and enduring acts of the Pilgrims and Pioneers of the world. Often, these were individuals that struggled for survival. One foot in front of the other. Wondering if they would even “make it”. By their thoughtful, committed passion for an idea and cause, they moved forward. Working to do what seemed right and good. Today we are the beneficiaries of these actions. Recently I saw a moving account of the early pilgrims who arrived on the Mayflower in the new world on the “History Channel”. I would like to share parts of that account today. In September 1620, a small ship called the Mayflower left Plymouth, England, carrying 102 passengers-an assortment of religious separatists seeking a new home where they could freely practice their faith and other individuals lured by the promise of prosperity and land ownership in the New World. After a treacherous and uncomfortable crossing that lasted 66 days, they dropped anchor near the tip of Cape Cod, far north of their intended destination at the mouth of the Hudson River. One month later, the Mayflower crossed Massachusetts Bay, where the Pilgrims, as they are now commonly known, began the work of establishing a village at Plymouth. Did you know? Lobster, seal and swans were on the Pilgrims’ menu. In November 1621, after the Pilgrims’ first corn harvest proved successful, Governor William Bradford organized a celebratory feast and invited a group of the fledgling colony’s Native American allies, including the Wampanoag chief Massasoit. Now remembered as American’s “first Thanksgiving”-although the Pilgrims themselves may not have used the term at the time-the festival lasted for three days. While no record exists of the historic banquet’s exact menu, the Pilgrim chronicler Edward Winslow wrote in his journal that Governor Bradford sent four men on a “fowling” mission in preparation for the event, and that the Wampanoag guests arrived bearing five deer. Historians have suggested that many of the dishes were likely prepared using traditional Native American spices and cooking methods. Because the Pilgrims had no oven and the Mayflower’s sugar supply had dwindled by the fall of 1621, the meal did not feature pies, cakes or other desserts, which have become a hallmark of contemporary celebrations. In 1817, New York became the first of several states to officially adopt an annual Thanksgiving holiday; each celebrated it on a different day, however, and the American South remained largely unfamiliar with the tradition. In 1827, the noted magazine editor and prolific writer Sarah Josepha Hale-author, among countless other things, of the nursery rhyme “Mary Had a Little Lamb”-launched a campaign to establish Thanksgiving as a national holiday. For 36 years, she published numerous editorials and sent scores of letters to governors, senators, presidents and other politicians. Abraham Lincoln finally heeded her request in 1863, at the height of the Civil War, in a proclamation entreating all Americans to ask God to “commend to his tender care all those who have become widows, orphans, mourners or sufferers in the lamentable civil strife” and to “heal the wounds of the nation.” He scheduled Thanksgiving for the final Thursday in November, and it was celebrated on that day every year until 1939, when Franklin D. Roosevelt moved the holiday up a week in an attempt to spur retail sales during the Great Depression. Roosevelt’s plan, known derisively as Franksgiving, was met with passionate opposition, and in 1941 the president reluctantly signed a bill making Thanksgiving the fourth Thursday in November. It is likely that the Pilgrims were not the first to begin this tradition as many throughout the world thought to pause and give thanks. 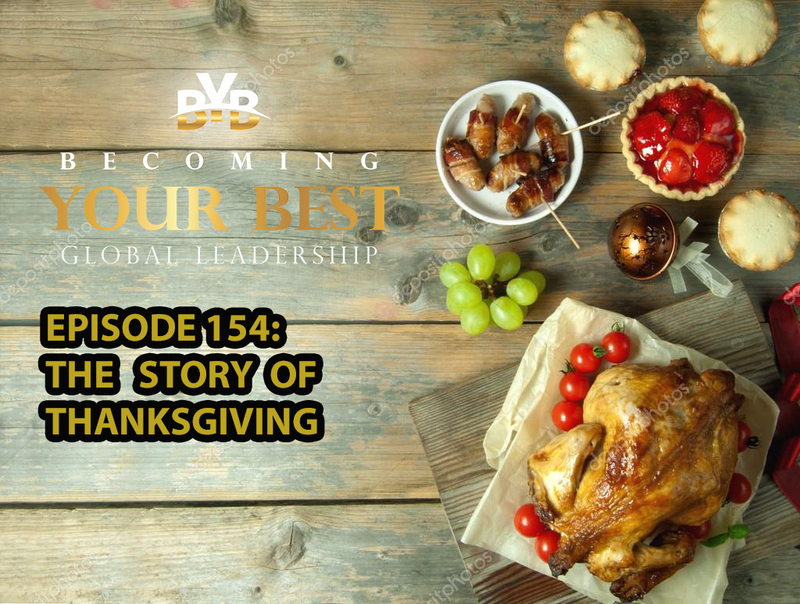 Although the American concept of Thanksgiving developed in the colonies of New England, its roots can be traced back to the other side of the Atlantic. Both the Separatists who came over on the Mayflower and the Puritans who arrived soon after brought with them a tradition of providential holidays-days of fasting during difficult or pivotal moments and days of feasting and celebration to thank God in times of plenty. I am grateful for those few thoughtful, committed citizens who thoughts to pause and give thanks, including my 9th grandfather, Governor Bradford, who continues to inspire me for so many good reasons. How can you and I give thanks today? How can the spirit of thanksgiving be meaningful in our lives every day? May I suggest three actions we can take that are thoughtful, that can change the world. At least, our world! 1. Always carry a spirit of humble gratitude and thanksgiving! My creator and maker; air; health; family and friends; whatever success I have experienced; a warm home, food, security, the beauty of the earth, adversity, and I am grateful for you. Every morning take a moment to pause and count your blessings! 2. Look for the good in other people. Granted, good may be harder to find in some people more than others! However, look for the good in all people. Be patient! Try to bring out the good in all people that you encounter. Set a goal to make at least 3 compliments per day of things that you see in other people. 3. Regardless of what happens in your life, say: What a blessing! And then think of a reason why it is so! This attitude will put you in a better place to handle all adversity and situations and to end up in a better place, with a better attitude. May these three things, these three habits, be a focus that will bless you and others throughout your life. These are the thoughtful, committed actions that change a world. At least your world and those around you. During this wonderful time of year, may you especially enjoy the spirit of Thanksgiving, while at the same time be committed to carry this spirit 365 days a year throughout life. Happy Thanksgiving, now and forever. This is Steve Shallenberger, your host wishing you a Becoming Your Best day!